There is a significant chance that Matthew, currently brewing in the Caribbean, could take a turn toward the United States as a hurricane next week. The budding tropical system was officially named Tropical Storm Matthew with winds of 60 mph (97 km/h) as of the midday hours on Wednesday, local time. The system has been producing tropical storm-force winds since Tuesday afternoon but had been struggling to form a complete circulation until Wednesday. The center of the system passed between Saint Lucia and Saint Vincent and the Grenadines as a strong tropical storm during Wednesday afternoon. Short-term rain, wind and sea impacts over the Caribbean will depend on how quickly the storm strengthens. Breezes will evolve into stiff winds, seas will turn rough and spotty showers will transition to gusty squalls and potentially into severe thunderstorms as the system moves westward over the Caribbean. Gusty squalls and rough surf will slowly subside across the Windward and southern Leeward islands on Thursday as the storm moves into the Caribbean Sea. The effects of the storm have the potential to become more severe and dangerous during Friday and the weekend. 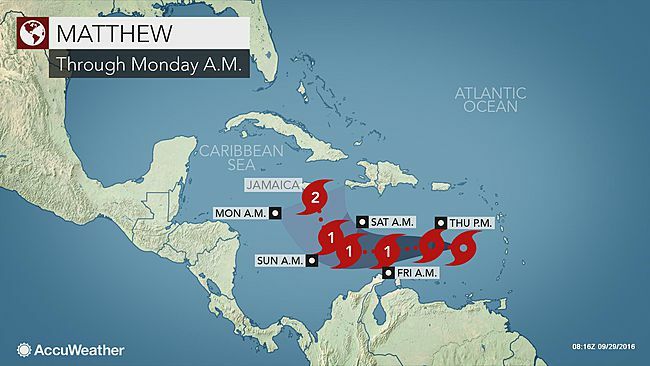 "Matthew will take a westward path across the central Caribbean, where strengthening to a hurricane is likely," according to AccuWeather Hurricane Expert Dan Kottlowski. As the storm moves along, strong tropical storm to hurricane conditions may affect Aruba and northern Venezuela on Friday, Colombia into Saturday and perhaps areas from Jamaica and Cuba later Sunday and Monday. 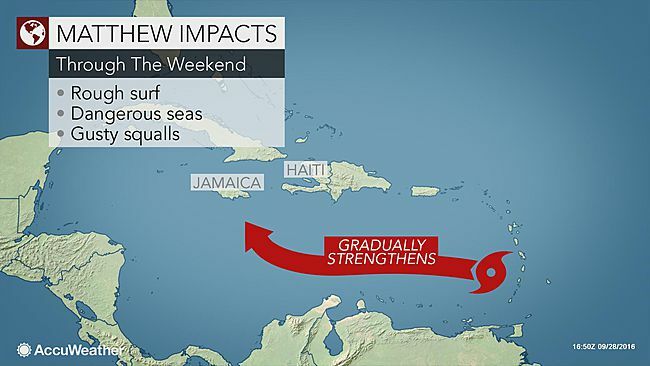 Cruise, fishing and shipping interests in the Caribbean Sea may want to avoid the area or remain in port until the threat passes beyond early next week. Interaction with the large land areas and mountainous islands could hinder the intensity of Matthew for a time. "A northward turn is not out of line with climatology with systems in the Caribbean during this time of the year," according to AccuWeather Tropical Meteorologist Mike Doll said. Matthew's movement will also dictate which of the Greater Antilles would be directly affected by heavy rain, flooding, mudslides and strong winds late this weekend into early next week. People and interests as far east as Haiti and the Dominican Republic and areas as far west as Central America should remain vigilant. How far west Matthew makes the turn will determine whether or not the U.S. Gulf Coast or the Atlantic Seaboard will be threatened later next week. There are two critical features that are likely to influence the track of the storm beginning late this weekend. A southward dip in the jet stream over the South Central states will likely tug Matthew northward initially. The jet stream is a fast river of air high in the atmosphere that guides weather systems along. A second feature may guide Matthew along later next week. A storm will bring rain to the Northeastern states into this weekend. If that storm lingers into next week, it could tug the tropical system toward the U.S. Atlantic coast. If the storm in the Northeast leaves and the slow forward motion of Matthew continues it may open the door for the tropical system to venture onshore in the Southeastern states. "Even if Matthew moves northward across Cuba early next week, as we suspect it will, then it could still find a way to get into the eastern Gulf of Mexico," according to AccuWeather Senior Meteorologist Bernie Rayno. "The track and strength of Matthew beyond four days is highly uncertain," Kottlowski added. More remote possibilities range from a continued westward path into Central America and a very abrupt turn to the northeast, keeping the storm east of the U.S. next week.